Luckily my Dad gave me his Abu smoker recently – I remember him getting it and using it quite a lot when I was half my current size, which was 20 years ago at least, since then it’s sat in the garage, all forgotten… I dug it out and put it on my shelf for a few months…. seemed it was doomed to the same fate, but Tandy’s smoking challenge is some motivation to fire it up! So, anyway, I found some fresh Yellowtail and Fennel, which seemed like a good start. and, yes, that is the cat in the background weighing up his chances…. Peel the Sweet Potato, Slice into 20mm slices, and cook in boiling water for about 10 to 15 minutes until just soft. don’t let it absorb too much water…. drain and put into cool water – wait until very cool , you don’t want to add the egg yolk when it’s warm, or you’ll have a spanish omelet! coarsely mash with a fork – lumps are good, they add a nice rustic touch, add egg yolks, cream and flour, mix until stiff dough.add more flour if it still sticks to your fingers. Roll into 20mm ‘sausages’, then cut into 20mm long sections with a floured knife – don’t get too involved with the sizes, ‘about’ is fine, It’s meant to be rustic. 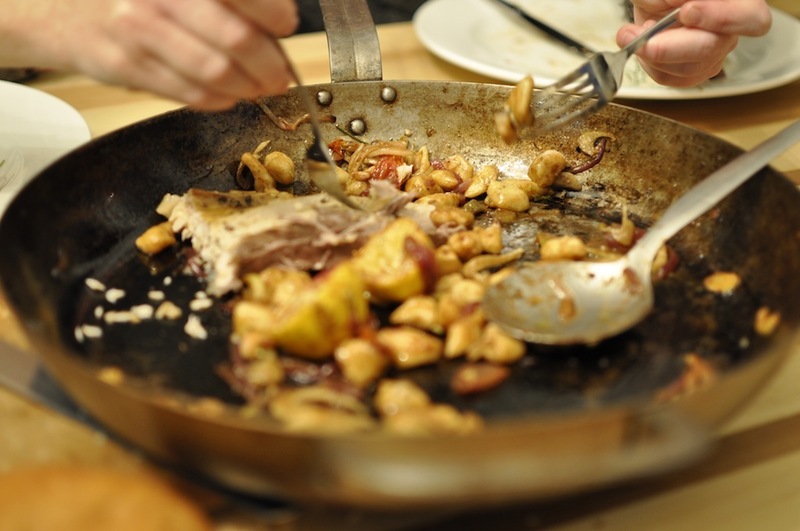 Cooking the Gnochi – make sure you have prepared the ingredients for the sauce and the fish BEFORE you cook this. 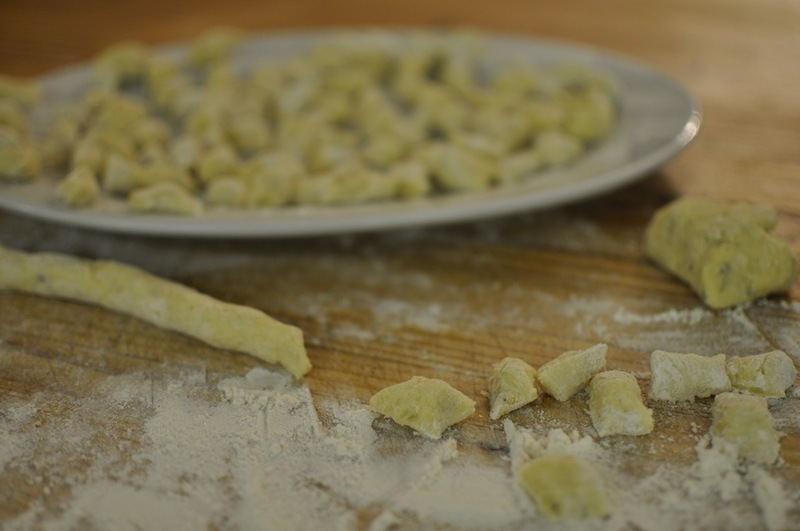 Bring a pot of water to the boil, add salt, put the Gnocci in in small batches – as soon as it rises to the top (2 or 3 minutes) it’s done. Remove with a slotted spoon and keep to one side in a bowl. Garlic, 8 cloves or so, cut into chunks, 2 or 3 pieces per clove. 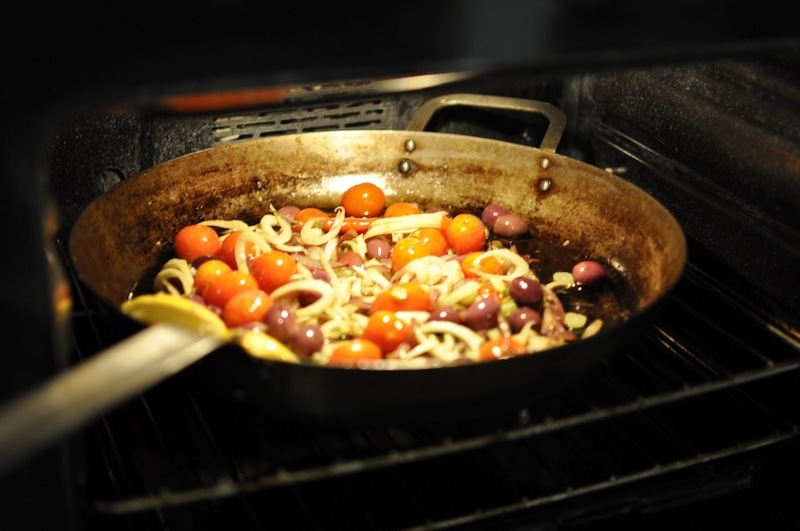 Select a pan you can put under your grille – no plastic handles – then start the sauce on the hob – First, soften the Onion gently in the Olive oil along with the whole chilli – 5 to 10 minutres. turn up the heat and Add the whole tomatoes, let them soften for 2 or 3 minutes, it they burst, great, if not don’t damage them. shake the pan frequently to ensure even cooking.. add the garlic chunks and thinly sliced Fennel – PLEASE make sure you clean the fennel properly, nothing ruins a great meal more than a mouthful of sand! 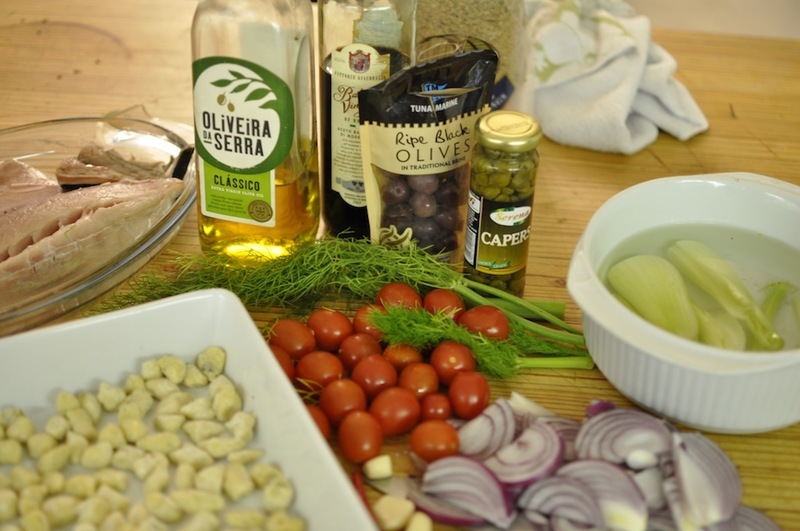 , give that a minute then add the Olives, Capers, Balsamic and lemon juice. Stick it under the grille, keep an eye on it, don’t let it burn while your fish finishes cooking… Give it a few shakes to keep it happy AND DON’T FORGET THE HANDLE IS HOT!!! use oven mitts! 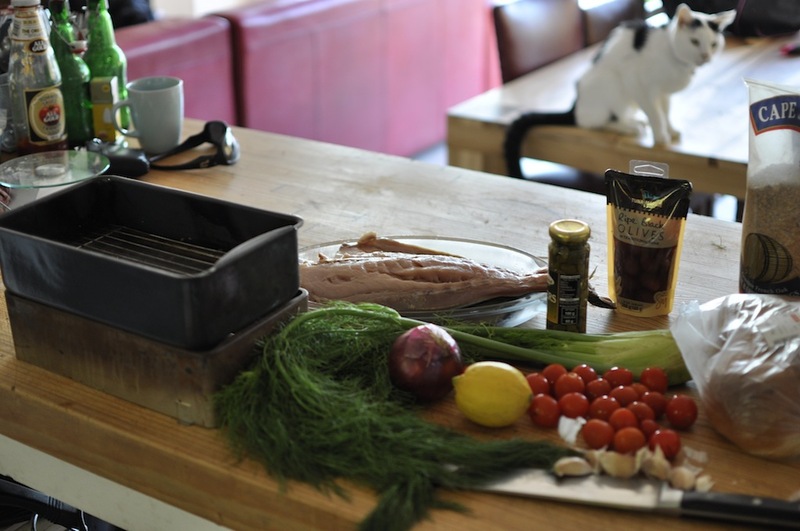 1.1kg Yellow Tail Fillet – skin on. I’m using the Abu smoker so you place your damp shavings on the base of the smoker, then put the tray and grill over it, I think most hot smokers work this way. cover the Grille with the Fennel Fronds and place your Yellowtail on top of that, skin side down. Squeeze the lemon over the flesh, Season and put a few knobs of butter on it. 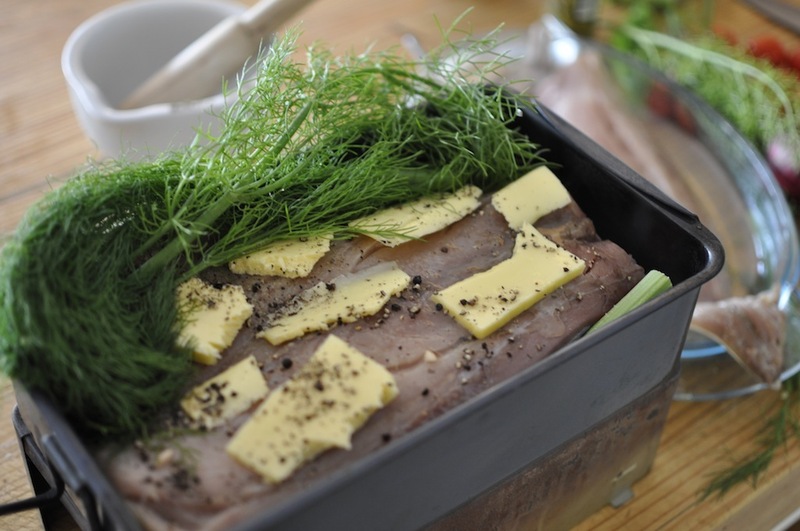 cover in more fennel fronds and close the lid. It’s a little hard to say how long as I didn’t put the gas on hard enough at first – you need to get some heat into the shavings, rather just whack it on full blast. once we got it going, we just opened the lid and held a fork in the flesh for 20 seconds or so to test it – it’s cooked if the fork comes out warm… 10 minutes or so is what you are looking at here… discard the Fennel Fronds. As soon as the fish is finished, put the sauce back on the heat, and stir in the gnocchi. don’t let it stick, just toss it in the juices long enough to warm it back up. Put a good sized serving of the Gnocchi / Sauce mixture on warmed plates (ensuring an equitable amount of olives and tomatoes on each plate!!) 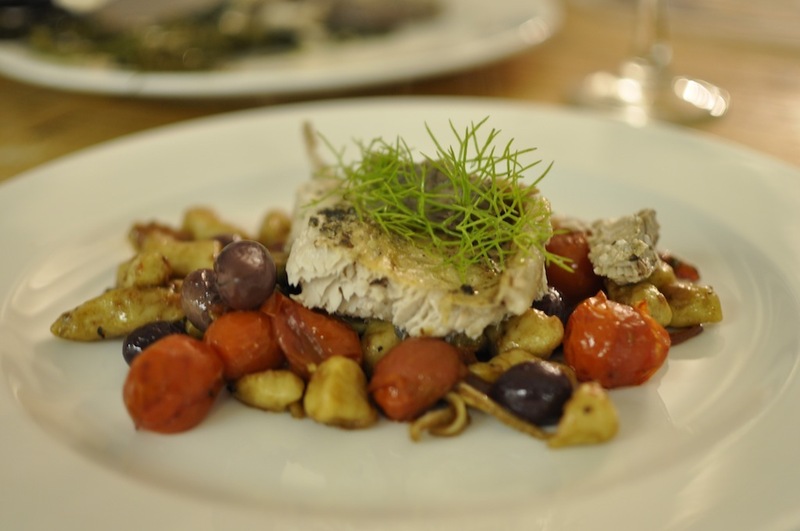 , divide a piece of fish off the fillet – leaving the skin behind – and place on top of the gnocchi, garnish with a piece of reserved fennel frond and…. To price this, the whole yellowtail cost me R77 filleted – about 2.2kg after filleting. for 2 kids and 4 adults thats an obscene amount of food with the Gnocchi and sauce. The other stuff – Olives, 1 sweet potato, few tomatoes, capers, an onion, loaf of bread etc, plus the usual kitchen bits can’t be more than that – call it R150 altogether – R25 a head, for food like this, that is a real pleasure. I’m sure it was delicious. Wonerful post, wonderful recipe and wonderful shots! Thanks so much!!! It was lots of fun ! Hope kitty got a little bit of fish too. sadly Dave was far too quick for the kitty! but hey, it’s not like they starve in this household! You made gnocchi seem so easy that I shall try it. Well, it’s easy enough, and it’s much tastier, it’s more time consuming than difficult! enjoy! Love the frying pan shots – excellent. Nice post. thanks, Luckily modern cameras do make it easy!